If you are looking for a compact sports hatchback, you should seriously consider checking out the Hyundai Veloster. Competitively priced, and nicely designed, this 3 door sports coupe ranks among the top models in its class. 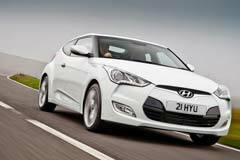 The Hyundai Veloster was launched in 2011, so if you are considering buying a used Hyundai Veloster it is quite easy to find one in good condition. This car is really practical and stylish. It comes with a 6-speed automatic, manual or dual-clutch transmission. From a performance point of view, the Hyundai Velostar received good ratings. Its asymmetrical door configuration makes it stand out when compared with other models. The driver’s door takes up that side, whereas on the other side one will find two doors. This may not make it a vehicle that is ideal to serve as a family car, but it certainly appeals to the younger generation. Another point worth highlighting is the fact that there are well chosen trim materials, and a modernistic ambiance inside the car. 2017 Veloster Value Edition 2017 Hyundai Veloster Value Edition 7946 Miles Ultra Black Pearl 3D Hatchback 1. 2016 Veloster 3288 2016 Hyundai Veloster 3288 73794 Miles Vitamin C 3dr Car Regular Unleaded I-4 1. 2012 Veloster -- 2012 Hyundai Veloster, Century White with 84620 Miles available now!